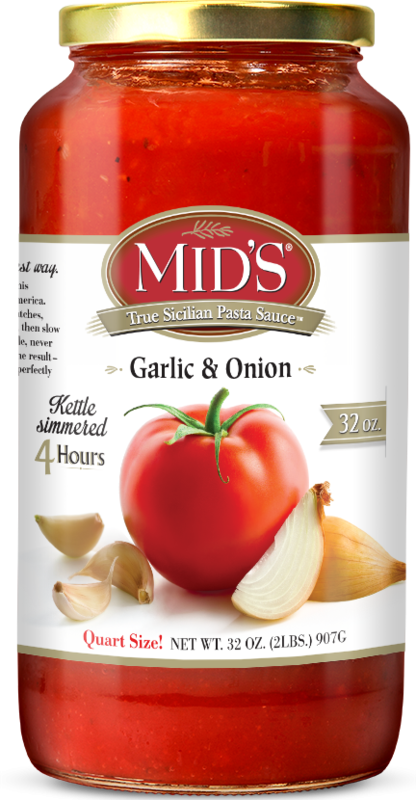 Using our traditional meatless sauce as a base, MID’S Garlic and Onion sauce blends two classic flavors for a taste right out of the hills of Sicily. The newest addition to our delicious true Sicilian pasta sauces, this all-natural, gluten-free sauce packs bold, rustic flavor into every hearty bite. Your family will know they’re in for a treat when they smell MID’S Garlic and Onion sauce. Spoon generously over spaghetti or your favorite pasta, or add to lasagna for a wow-inspiring meal. Ingredients: Water, Tomato Paste, Sugar, Olive Oil, Salt, Onions (Minced and Sliced), Romano Cheese (Made From 100% Pasteurized Sheep’s Milk, Bacterial Culture, Salt, Rennet), Garlic, Spices, Citric Acid, Paprika.